Easter is just around the corner and I’m setting aside all my favorite recipes for this spring holiday. Roast lamb or a baked ham are our typical family favorites (sometimes both if we’re feeding a crowd), an asparagus dish (either simply steamed and spritzed with Meyer lemon juice or this lovely Flemish version with a bit of hard boiled egg, lemon juice and fresh parsley), a big salad, and a potato dish of some sort (usually the classic Scalloped Potatoes) is a must. This year I’ll make a loaf of this beautiful Easter Bread with Colored Eggs. 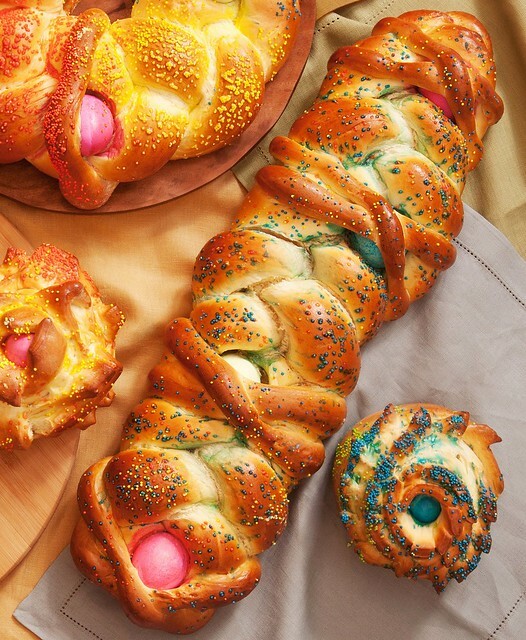 This whimsical sweet braided bread is studded with colorful Easter Eggs making it a fun treat for everyone, especially the little ones! This recipe comes from Chef Sal Scognamillo of Patsy’s Italian Restaurant in New York City, the original Scognamillo family owned and operated Italian restaurant since 1944. To make the sweet dough: combine the milk, sugar, eggs, yeast, lemon zest, anise seeds, and salt together in the bowl of a heavy-duty stand mixer. Mix with the paddle attachment on low speed until combined. Gradually add 3 ½ cups of the floor to make a thick batter. One tablespoon at a time, beat in the butter, waiting for the first addition to be absorbed before adding more. Gradually add enough of the remaining flour to make a soft dough that cleans the bowl. Switch to the dough hook and mix on medium-low speed, occasionally pulling down the dough as it climbs up the hook, until the dough is smooth, shiny, and slightly sticky (do not add too much flour), about 8 minutes. To make the dough by hand: whisk the milk, sugar, eggs, yeast, lemon zest, anise seeds, and salt together in a large bowl. Gradually stir in 3 ½ cups of the flour to make a thick batter. One tablespoon at a time, stir in the butter, waiting for the first addition to be absorbed before adding more. Gradually stir in enough of the remaining flour to make a dough that cannot be stirred. Turn the dough out onto a lightly floured work surface and knead, adding more flour as necessary, until the dough is smooth, supple, and slightly sticky (do not add too much flour), about 10 minutes. Line a large rimmed baking sheet with parchment paper. Divide the dough into thirds. Roll each piece of dough underneath your palms on the work surface into a 20-inch rope, tapering the ends. Line up the ropes next to each other. Starting from the center, braid the ropes to each end, pinching the rope ends together to shape into a tapered loaf. Transfer the braid to the parchment paper-lined baking sheet. Cover loosely with plastic wrap. Let stand in a warm draft-free place until almost doubled in volume, about 1 hour (or about 1 ½ hours for chilled dough). During the last 15 minutes of rising, distribute the eggs evenly over the top of the braid, nesting them in the seams. Brush the braid lightly with the egg glaze and sprinkle with the nonpareils. Bake until the loaf is golden brown and sounds hollow when tapped on the bottom, about 30 minutes. Let cool completely before slicing. Note: To color the eggs, you can use a commercial coloring set, or make your own coloring dip. For each color, combine 1 ½ cups boiling water and 1 teaspoon white distilled vinegar in a large glass. Tint the liquid as desired with food coloring gel (which has deeper colors than liquid coloring, although you can use liquid). Dip each egg in the coloring mixture, and let stand for at least 2 minutes, or until the desired color is reached. Remove the egg from the coloring mixture and let dry on a wire cooling rack set over a baking sheet.